Each week, Voice of Russia hosts Red Line, a discussion about the events of the week, as seen from Moscow. This week, the resignation of Robert Gates, the death of Yelena Bonner, and Aung San Suu Kyi. Ekaterina Kudashkina: This week we will start with the much-discussed resignation of United States Secretary of Defense Robert Gates; then we will move to Yelena Bonner, human rights activist and widow of Andrei Sakharov, who passed away in Boston; and finally our person in the news this week is Aung San Suu Kyi, the winner of the Nobel Peace Prize and the Sakharov Prize for the Freedom of Thought. Sergei Strokan: All in all, we have three personalities who spent large parts of their lives fighting for freedom as they saw it. Ekaterina Kudashkina: Now, Beyond the Headlines – our first section in which we will discuss the changes in the Pentagon. Outgoing Defense Secretary Robert Gates will be replaced by current CIA Chief Leon Panetta. What does it mean for Russia and its relations with the U.S.? Should we expect major changes in U.S. defense policy? Sergei Strokan: I feel that Gates’s departure is more than just a routine reshuffle; it symbolizes a change in American foreign and defense policy, which will probably lead to its radical transformation, regardless of who wins the next presidential elections – Barack Obama or his Republican rival. Robert Gates owes his career to his own talent, perseverance, a little bit of luck, and an enormous sense of duty. To me, Robert Gates is a man working for a cause – the good of the United States of America. Mira Salganik: Gates wants to avoid criticism of President Obama, at the same time he doesn’t conceal his apprehension that president of the United States is either unable or doesn’t want to keep up the U.S.’s superpower status. Sergei Strokan: I think that Robert Gates’s story is a drama of a Cold Warrior – an old die-hard soldier who is still full of fighting spirit but is too intelligent not to see that his weaponry is outdated and – the battlefield is not what it used to be. Mira Salganik: Mr. Gates is, of course, an experienced man and an intelligent person, so he is fully aware that in the world there is a new shift of power from West to the East, with the emergence of new centers of power. Sergei Strokan: I think that we need to look at him through Russian eyes. I think that Russia probably sees the departure of Robert Gates as a wind of change blowing in a new direction. The world once used to be bipolar, then became unipolar and now is becoming multi-polar or non-polar. It was this time of superpower rivalry that largely shaped Mr. Gates’ political vision of the world. However, this doesn’t mean that he was completely unable to accept change when the Cold War was over. Sergei Strokan: After the war in Georgia broke out, it was Robert Gates who opposed any U.S. action against Russia. I believe that was the reason President Obama chose to retain Gates as the Pentagon chief. Ekaterina Kudashkina: All in all, it looks like even the most seasoned soldiers of the Cold War are unable to withstand the pressure of changing times. I think it is an old story; accepting change is difficult. Now I suggest we listen to our guest speaker, Mark Perry, a well-known U.S. military and intelligence analyst, who is going to tell us more about Robert Gates and his legacy. Mr. Perry, how do you see what could Mr. Gates’s major achievements in this position? Mark Perry: I think when we point to Secretary Gates, it is kind of an irony that we point to what he didn’t do. When he became Secretary of Defense, there was a strong sense in the country that America was on the verge of a wider conflict in the Middle East, perhaps even with Iran, maybe Syria. And we have to remember the time, there was a great fear here, that was the case, and the United States was engaged deeply in Iraq and with no way out. Gates dampened the move towards war and widening of conflict in the region. I think his most significant achievement is that Robert Gates actually kept the United States out of a wider conflict in the region while working diligently to dampen the conflicts that we were then in. Ekaterina Kudashkina: What kind of legacy does he leave for his successor? Mark Perry: It is probably unknown to the wider world, but Robert Gates was the author of the weapons procurement reform in the Pentagon, and this is something he wrestled with outside of the public eye every single day, how to bring the Pentagon’s budget under control and how to make certain that the needs of the armed services were met and not oversubscribed. I think he began a long, slow process in America of breaking up the military-industrial complex. Ekaterina Kudashkina: Do you think this process is going to continue under the new secretary? Mark Perry: I think, in fact, that this is why the new secretary was appointed. 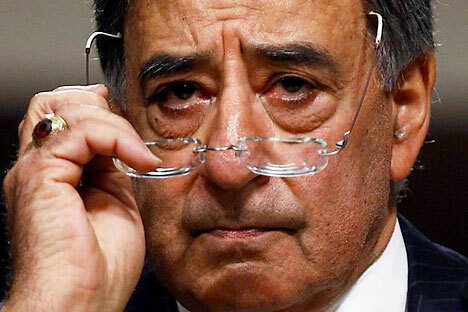 Leon Panetta is a very capable political thinker, but his background is as a politician, not as a military man. In fact, this is exactly what the Pentagon needs, someone who can wrestle with and gain control of the Pentagon bureaucracy and run it and not to allow it to run him. So actually while it seems that Panetta is cast from a different mold than Gates, actually he is the most appropriate successor. Ekaterina Kudashkina: If we move a little bit to foreign relations, do you think that the new appointment will make a difference in the current relations between the U.S. and Russia, the U.S. and the rest of the world? Mark Perry: I think it is obvious to everyone who is in the policy-making establishment in the United States that our country is engaged in a military retreat, which is not the same thing as a strategic retreat. Our relationship with Russia has been rocky; I know that the Russian leadership has tried mildly to maintain stability in the relationship, but it is still fogged with misunderstandings. And I think that one of the reasons that it is fogged with misunderstandings is because of the justified fear on the part of Russia of an expansionist America. Secretary Gates made it clear to them that while we will always defend our interests in Europe and South Asia, it is not our intention to subvert Russia’s interest and that we can work together. Ekaterina Kudashkina: Now it’s time to move to our second section – Between the Lines – in which we discuss some of the most interesting articles published in the press this week. This time, I suggest a story in the Boston Globe about Yelena Bonner. Yelena Bonner was the wife of Russian physicist and human rights activist Dr Andrei Sakharov, and a human rights activist and a prominent Soviet dissident herself. She was well-known and respected in the West, since for many years she served as Dr. Sakharov’s representative in the western community. She spent much of her life fighting for democracy and prisoners’ rights in the Soviet Union, but her ties to Boston ran deep: She split her time between Moscow and an apartment in Brookline from 1989 until her death June 18. Because of her ties to Boston, the Boston Globe ran a story that was not exactly an obituary, but rather, a selection of interviews and accounts from those who knew her personally, and that is the reason we selected it for this program. Mira Salganik: I think not only that she demanded to be heard, but she could always make herself be heard. Ekaterina Kudashkina: Let us go into detail. Yelena Bonner was born in Turkmenistan into a family of staunch revolutionaries. When they got to Moscow, they lived in Hotel Luxe on Gorky Street, which lodged high-profile foreign communists working in Moscow. Her father, Gevork Alikhanov, was a prominent Armenian communist and a secretary of the Comintern, the "general staff of the world revolution." And her mother, Ruth Bonner, was born in Siberia and joined the Communist Party in 1924. In May 1937, her father together with many other Comintern officers was arrested, and the family had to leave Moscow. But upon leaving Moscow, Ruth and her two children moved to her mother's apartment in Leningrad. But later that year she, too, was arrested and sentenced to hard labor as the wife of a traitor. In 1954, Ruth was released, granted a special pension, and an apartment on Chkalov Street in Moscow. This apartment became Yelena's home and in 1971 Andrei Sakharov moved in. Sergei Strokan: But getting back to the Boston Globe story –what did her American friends say about her? Ekaterina Kudashkina: Friends and neighbors spoke of Dr. Bonner as a vibrant, intelligent woman who loved reading and writing poetry, spending time with her grandchildren, and chain-smoking acrid Russian cigarettes. Let’s now turn to our next guest speaker, Alexander Gessen, who has known Ms. Bonner for 30 years or even more. Alexander Gessen: I knew her for more than 35 years, I couldn’t say that I saw her on a regular basis, but I met her many, many times during these years. The first time I met her was in 1985 when she came to the United States for medical treatment. I was friends with her daughter, that is how I met her. Tatiana, her daughter, asked me to drive her from the airport, so we met her at the gate, and we walked very slowly and we carried a chair, because she needed to sit down every few moments. And then quite quickly she had surgery, and it was really amazing how energetic she became very, very quickly after the surgery. The main thing was that with the people she liked, she was just amazingly friendly and outgoing, and she could be really sharp and unfriendly with people she didn’t like. She had to fight them. She could change just like that in a second, depending on the situation. Ekaterina Kudashkina: Did she make some kind of stark contrast with her husband? I mean Dr. Sakharov used to be so soft-spoken and reserved, and Ms. Bonner was outspoken. Alexander Gessen: That’s true. I had the honor to meet Andrei Dmitrievich a few times, but I didn’t know him too well. But yes, they were very different. He was very polite, very quiet, very friendly. A funny thing about him I just remembered – I had this photo camera which was really new, it was an autofocus camera, and he saw that, and he took it from me, and it looked like he wanted to take it apart to understand how it works. It was really amazing. He was very interested in everything. Ekaterina Kudashkina: As far as I understand, Ms. Bonner was the type who was looking for the truth everywhere, so what did she think about, first of all, about perestroika, what did she say about other problems worldwide, was she as active? Alexander Gessen:I don’t remember all the things she was interested and involved in, but one of them was Israel, she had a very strong opinion on that. She wouldn’t hesitate to air her opinions on anything and she had quite a few of them on many things. She was an avid reader, she loved poetry. Ekaterina Kudashkina: One thing that struck me in some newspaper account was that even in the United States, in her apartment in Boston, she had her TV set to news from Moscow, news from Russia. Alexander Gessen: Even though she lived here and spent her last years here, her thoughts were in Russia. Ekaterina Kudashkina: But her family is in Boston? Alexander Gessen: She enjoyed her children and grandchildren immensely. But family is one thing and country is different. Ekaterina Kudashkina: She was a human rights activist. Do you think that it is an in-born quality in people, or is it developed? Alexander Gessen:I think it is both; it should be in-born in a sense, but then you need a chance for that to develop, I think. Ekaterina Kudashkina: Now we will move on to Red Line’s final section, Face in the News. This week we are going to speak about Aung San Suu Kyi, the famous fighter for freedom and democracy of Burma. Sergei Strokan:Why Burma? Has not the country been renamed Myanmar? Ekaterina Kudashkina: Well, both. Officially, it is Myanmar now, after was renamed by one of its military dictators, but since Aung San Suu Kyi insists on calling her homeland Burma, I think we could honor her preference. There are two basic reasons we decided to talk about her today. One reason is that last Sunday, Aung San Suu Kyi celebrated her 66th birthday. Mira Salganik: And it was the first birthday in 20 years she celebrated out of detention. Ekaterina Kudashkina: The other reason we chose this topic is the upcoming international broadcast early next week of her fight-for-freedom manifesto. According to the Guardian, one of her lectures was secretly recorded in Burma and brought to Europe. Just to remind our listeners who Aung San Suu Kyi is: She has spent 21 years resisting the oppression of her people by a military dictatorship and she has been insisting on peaceful resistance – just like the U.S. civil rights leader Martin Luther King. Jr. and Mahatma Gandhi of India. Mira Salganik: What happened was that after living many yeas outside Burma, she came back in 1988 because her mother was gravely ill, and she was never let out of Burma again. In 1990, the military junta that was ruling the country decided to stage a kind of election. By that time, Aung San Suu Kyi was the head of a political party called the National League for Democracy. It received 82 percent of the vote, but the vote was nullified by the junta and she was put under house arrest. The next year she was awarded the Nobel Peace Prize, but she wasn’t allowed out of Burma, so her husband Michael Aris received the prize instead of her. Ekaterina Kudashkina: Just like Dr. Bonner was receiving the Prize instead of Dr. Sakharov. Mira, I remember you telling me that back in 1988 she said her famous phrase: "I cannot, as my father's daughter remain indifferent to all that was going on." Who was her father? Mira Salganik: She is the daughter of General Aung San, a legendary figure, a general and a nationalist. Aung San headed the revolt against the Japanese occupation of Burma, and triumphed, but he was assassinated six months before Burma got its independence. Nobody knows for sure who killed him. At the time of her father’s assassination, Suu Kyi was barely two years old. After the country became independent, her mother took her to Delhi where she went to the university. In 1961, Burmese diplomat U Thant was elected secretary-general of the United Nations. He brought in a team of Burmese associates and Aung San Suu Kyi was among them. Ekaterina Kudashkina: The next year, a military junta came to power in Burma in a coup d’etat. Sergei Strokan: General Ne Win’s “revolutionary council” nationalized or brought under government control practically everything in Burma, successfully hampering Burma’s development in the process, until it became one of the least developed nations in the world. Mira Salganik: Ne Win has been at the helm more or less for 26 years. Burma is isolated from its neighbors; the west has imposed sanctions. Burma is a patchwork of various ethnicities, languages, religions, so the general has always had a good pretext to suppress protest movements, saying that they were a threat to the sovereignty of the country. Ekaterina Kudashkina: Anyway, I’d like to conclude this piece by quoting a recent speech by Aung San Suu Kyi. She said that whenever she was asked at the end of each stretch of house arrest how it felt to be free, she would answer that she felt no different because her mind had always been free. She said: “I have spoken out often of the inner freedom that comes out from following a course in harmony with one's conscience." And I’m sure, our listeners will find it interesting that in 1990 Aung San Suu Kyi was awarded the Sakharov prize - for freedom of thought.